...on a Sleigh Bed!! I have always love the way Sleigh Beds look. I don't currently have one but someday, maybe I will! Their elegance and beauty add a touch of charm to any room. Thanks to a wonderful Cymax store, bedroomfurniturenmore.com, I definitely will have some great options if we ever decide to buy one. There are some really gorgeous ones on the market today. I love how you can get them in either high or low foot board styles. That is something that you do want to consider...especially if you are a tall person. My hubby is over six feet tall so he needs leg room. I can just picture us relaxing on our king sized Sleigh Bed! Ahhh...sounds SO great! I love the looks of this one...so very cozy and dark wood is my favorite. Speaking of sizes, bedroomfurniturenmore.com has all types and sizes of beds. So if I wanted to purchase a king sized bed, I could do so very easily. My daughter currently sleeps on a full sized bed...so if I wanted to get her a cute children's bed, I could! Another really terrific idea for a child's room is a day bed. I could really benefit from this as our home is tiny...meaning that our rooms are tiny. So Hannah's room gets really cramped very quickly. Her current bed is a futon, but is very difficult to open and close. I could use something easier for sure! Day beds can be so convenient...close it up in the morning to open up your living space; then open it up in the evening to create a bed for your child. I have always loved the idea of day beds. With all this talk of new bedroom furniture...it may be good to try to spruce up the decor' in the bedroom as well. As I was browsing around bedroomfurniturenmore.com I was really surprised at all the bedroom decorating ideas I saw. 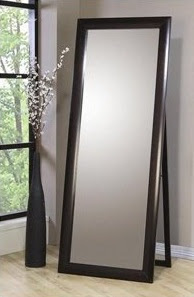 They have vanities, night stands, mirrors and so much more! Currently, my bedroom is too small to even think about adding a vanity but if I could, I would probably pick the one pictured above. Isn't that a gorgeous piece of furniture!?! So, in my opinion...the Cymax store, bedroomfurniturenmore.com is fabulous! The selection is perfect and really has something for everyone. Great store and wonderful product selection! oh my gosh I love sleigh beds! I will definitely have to check these out, I've been asking hubby for one for a year now. We have little room so I can't get such a beautiful frame/headboard/footboard but what a nice selection! It looks like they have a lot of furniture that I could use - That sleigh bed is beautiful - My daughter would love it! The Sleigh Bed looks great! I love looking around on there. Love the bed and the full length mirror. Hopefully by this time next year after my husband has finished grad school we'll be able to get new furniture.